Video: Japan Vogue March 2012 Presents Matador. Years ago, before I happily started meddling within the fashion world, I would have my imaginary fashion shows in my head while flipping through the pages of Vogue, Harper’s Bazaar, Elle and W, sitting on the train to and from work, and listening to the songs from my special play-list created just for my magazine time. I would imagine changing around some of the outfits that were on the models, and the music on my ipod be the soundtrack for each fashion spread I revamped in my head. Youtube Video: Fashion Style Mobile. If memory serves me right, once upon a time, the laptops were created as our portable computers. The first versions were heavy, and not pretty to look at, but still small enough to fit into our hobo handbags. As the years have come and gone, the laptops have become our new desktops and they’re lighter than ever for the fast-pace lives we live. Yet most of us no longer take out laptops or Macbooks with us when we travel, especially if we have smart phones, Ipads and Tablets. I know I haven’t been sharing much lately, the Christmas festivities have been getting the best of me! I’ve also been working on getting over my fear of being in front of the camera so I can start sharing my styling tips and advice beyond the written words on my site. My first exposure to fashion was through the words in the magazines. Always loved reading fashion stories, ripping the best articles out of magazines as historic reference or just reminiscing, like the first time I first saw Proenza Schouler among the pages of Vogue. Fashion stories from yester-years are like the nursery rhymes we first fell in love with as young children, now, as we’re older, some of us wiser, the nursery rhymes have now been revised, for our viewing pleasure, the TV shows Grimm and Once Upon A Time are perfect examples. So now I think of Mobile Fashion as our future, it will no longer be just tweets or links to posts on blogs or fashion websites for our reading pleasure, but vlogging and video channels that will show us who are true trendsetters and fashion smartie pants wearers out there. I personally have like three pairs right now. Going back to me getting over my fear… sometimes words in black and white aren’t enough. The need to see the person behind stories and to see the passion expressed for this form of art, can reach more people and help some have a better understanding or least a bit more respect as to why fashion is a way of life for us. 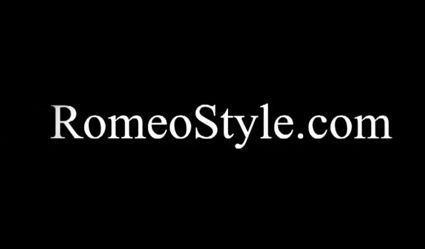 So with some market research and a verbal lickin from a friend to get over my silly fear, my first Youtube video is here on my very own channel RomeoStyleTV. No better time to do this than the during the holidays when we celebrate and shop for that outfit which will most likely be worn only once. Well the video not only gives you guys a peak as to what I found for $100 or less, but I also share styling tips that may come in handy for the tons of parties you’ll be attending. Tuxedo for the Ladies!